AHH! We are in week 4 and I am no where near where I need to be for training. Good thing there are another 25 weeks to go after this… I really need to get on the ball! 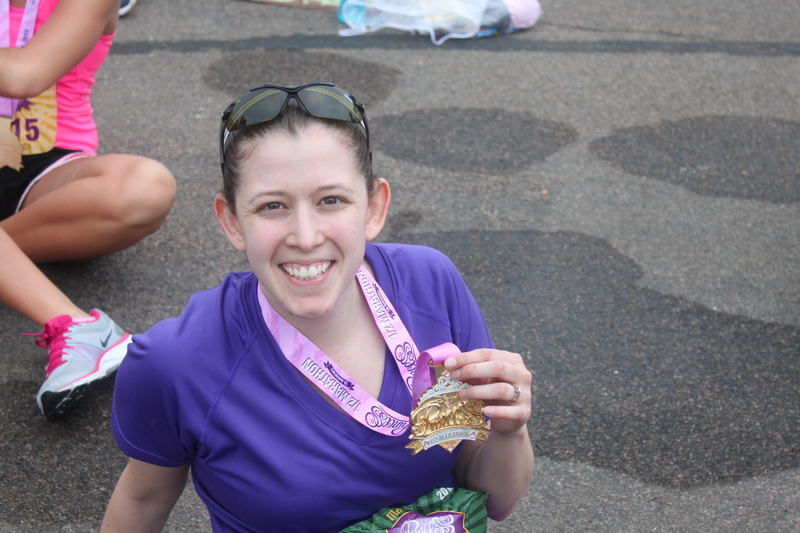 While I am super proud of finishing the 2013 Princess Half, I didn’t train at all and paid for it. I don’t want to end up there again with the WDW Marathon 2015! Are you keeping up with your training?? Welcome back to my healthy series. For the month of July I am focusing on food and determining what is healthy and what isn’t. A big debate on healthy food surrounds the meat v. no meat issue. Is it healthier to have a diet free of animal by products? Or, can you have a healthy lifestyle while still imbibing in a little steak now and then? Or, even all the time?? Forgive me if I sound like a broken record, but I do truly believe in an “everything in moderation” lifestyle. I personally believe you can have a healthy lifestyle and diet and still eat animal products. I do think eating mostly veggies and fruits and whole grains is the best way to go, but I do love some butter on my salmon and a grilled steak for dinner once and awhile. It is easier to have a “balanced” diet when you are not restricting certain food groups. Which means for most of the population, having animal products in their diet allows them ease in having all their necessary nutrients. It is not impossible to eat a balanced diet while going vegan or vegetarian, but it does require a bit more consideration when it comes to protein. YES, there are TONS of vegan/vegetarian friendly protein sources, but chicken, fish, etc…are just so obvious. Since I do all of our food planning and most of the food prep, I can speak for both myself and my husband when I say that we eat a healthy serving of animal products. I do try to cut back here and there, but I don’t worry about it too much. For us, it is not a conscious-bearing decision. We eat meat and we don’t think about it too much. But, we do have several friends and family members who choose to avoid it. We do have several vegan/vegetarian friendly recipes and cookbooks at arms length and often cook them when its just the two of us. What’s your take? Do you believe a meat-free diet is is healthier and worth the restriction? What makes food healthy or unhealthy? In general, most people seem to agree that eating more fruits and vegetables and less sugar and fat is probably a good bet for a “healthy” lifestyle. But too many fruits and veggies and too little fat is unhealthy. Just like the inverse. I guess the answer is that food is “healthy” in relation to the other foods you are eating. And that balance really is the key. Some people are really good at eating only the best foods all the time. For most of us, that isn’t the case. We have our weakness foods or just aren’t that strict. Are we unhealthy? My argument is no… that balance is healthy and that indulging is healthy sometimes too. Breakfast — a glass of water (I don’t do coffee) and either greek yogurt (Yum to Chobani coconut blended) with fruit and KIND granola (love the crunch!) OR egg scramble with veggies, sometimes in a whole grain tortilla or on an ezekial muffin. Today I had a peach and a slice of homemade banana bread (banana, coconut, pecan with protein powder in the mix). Mid-morning – cold water, sometimes an apple or a handful of nuts, but usually I am good until lunch. Lunch – I love a wrap or salad for lunch. For wraps I use whole grain tortillas with a smear of dressing or spread (hummus, cheese mix, etc), some chopped chicken or other meat/protein, and either spinach, kale, or coleslaw mix (no dressing, just the cabbage mix). I’ll usually have this with a piece of fruit or some chips, depending on how I’m feeling. And, more water. Mid-afternoon — more cold water! And sometimes a few bites of something quick…sometimes that means some Oreos and sometimes its an apple or some carrots sticks and hummus. Dinner – Dinner is my favorite because I can get creative. Generally we will have a protein and veggies and sometimes we’ll have a starch or side with that. I love to mix it up though and we’ll occasionally do pizza or a pasta bake. Most days I try to do a lean protein and double veggies to keep it healthy and balance out the days we indulge a little more. Tonight we are having leftover chicken and roasted zucchini and squash. After-Dinner — Not gonna lie, I often go back for a sweet treat after dinner. I find I am happier when I let myself have what I want. I can also balance more and not over-indulge. Last night I had a bowl of cookies and cream ice cream. The night before I had an Oreo (I know…we’re on an oreo kick, not sure why?!). What’s a “healthy” day look like for you? I’m still not doing well with getting my training in. We are still dealing with a storm of stuff personally. But I have plans to get on track next week. I am hoping to get my 3 miles in on Saturday! Today is not looking good for the 45 mins…my stomach is quite upset today. How are you doing with your training? ?